Websites created by Modiphy include our proprietary Content Management System (CMS), which means you can edit the text on your site, create blog posts, or upload photos whenever you wish. For any changes to the content of your website, you won’t need to put in requests to us or wait on anyone else. Just log into your CMS from any computer. It’s as easy as can be. Add items from a gallery of product images when new shipments come in and delete discontinued items when they go out of stock. Organize the gallery with the tags and categories you define. 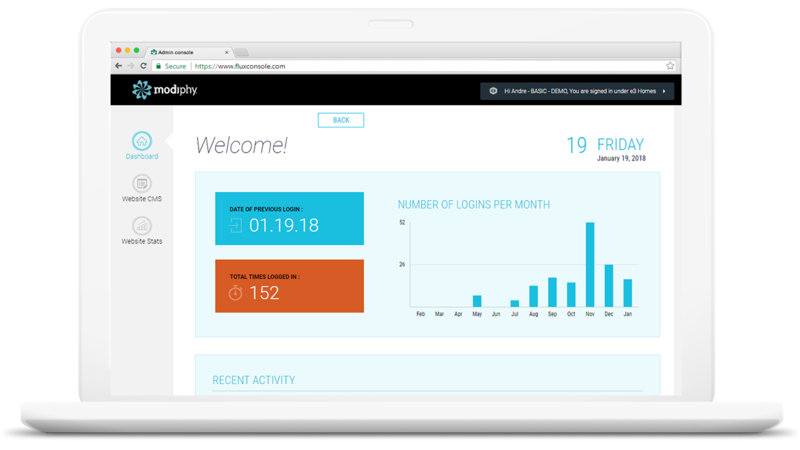 Modiphy also integrates your site with Google Analytics so you can monitor your site traffic and measure the success of marketing efforts. Modiphy® offers an intuitive and hack-proof state-of-the-art Content Management System (CMS). Flux Console™ offers fluid editing capability from any location, anytime. Simplicity: Accessible from any device, the Flux offers "drag and drop" functionality throughout the system. Add, edit, hide and re-order pages with ease. Workshops are also available to transition the team to the system's benefits. Text Editing: Manage website text, create links, upload PDFs, update keywords, and more. And - the digital Holy Grail - embed Youtube videos within text in seconds. Photo Management: Add images to pages or product gallery. Create categories and captions. Organize and delete images with ease. Secure Hosting: Data and content is protected with impeccable security features and hacker invisibility. Modiphy® standards guarantee 99.99% uptime to all clients. Portability: All websites are designed to be portable. If there is a need to transfer to another host, files can be readily packaged as Standard HTML. Our websites are universally ready to display anywhere, anytime.